The iconic Elvis Slot offers a star-studded, rock-blasting & legendary trip to rolling riches! The reels are packed with Free Spins & Double Money Burst + Jukebox Features! 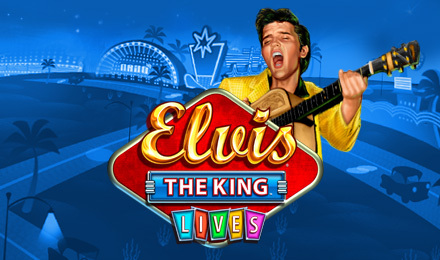 Follow the legendary King of Rock & Roll, Elvis, on a star-studded, interactive and musical adventure to rolling riches! Watch the crowd swoon as he unleashes his legendary moves onto the reels, while classic Elvis-themed guitar, records and blue suede shoes symbols roll onto the game. This iconic slot features 80 winning lines and a unique Double Money Burst engine feature, which triggers extra Free games and up to 100 x your total bet. There are multiple ways to unlock Free spins, and you can also rock to the thrilling Jukebox Feature. In this exciting round you can take your pick from iconic hits spanning Elvis’ career, from Hound Dog to Blue Suede Shoes, to win extra free spins and roll your way to rocking cash wins!